"I do not have to prove anything to anyone." The king of the stepover, and spring-heeled to boot, one of the finest footballers in the world today, who propelled Portugal to winning Euro 2016 with bravura performances before triumphantly lifting, after being crocked, the Henri Delaunay trophy. Cristiano explains the boiling resentment of emotion that motivates him on the pitch. Wear the philosophy, name and squad number of Ronaldo on your chest and back, doesn't afford us his talent, but young, old and in-between we can dream. Unisex size XL (48inch chest /120cms) Available as listed in drop-down menu. 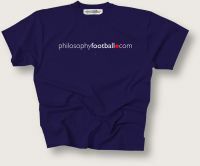 Gift-Wrap Service Exclusive Philosophy Football wrapping paper plus gift tag. To personalise your tag type the message you would like us to add into the box below.